At Amsterdam Airport Schiphol a night regime is in place. Night slots are required for departures planned between 22.40 – 06.59 LT (block times) and arrivals planned between 23.00 – 07.19 LT (block times). 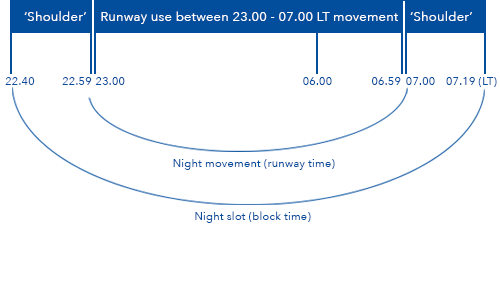 A flight operated between 23.00 – 06.59 LT (runway time) without having a night slot will be considered as unplanned night movement.